Powers/Abilities: The Scarlet Mage had a number of magical powers, including levitating objects, projecting or amplifying light to destroy Kx'ulthuum's demons, cast illusions, manipulate the weather, and perform spells such as merging a demon's arm with a man's body. (Conan the Barbarian I#169 (fb) / 170 (fb)) - Before Kx'ulthuum could carry out his scheme to use his Death-Sword to turn everyone on Earth into lifeless beings under his control, the sorcerer known only as the Scarlet Mage stole the sword and fled into the forests surrounding the mountain associated with Kx'ulthuum's realm. Knowing Kx'ulthuum would eventually overtake him, the mage hid the sword by causing a mighty oak tree to grow up around it. (Conan the Barbarian I#169 (fb) / 170 (fb) - BTS) - Kx'ulthuum entombed the Scarlet Mage in a mountainous cavern and sent demons to search for the lost sword. 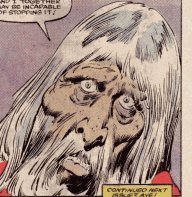 (Conan the Barbarian I#169) - The Scarlet Mage appeared as a vision before Conan and guided him to the Sword of Kx'ulthuum, which he made visible to him, and Conan used it to fend off a band of attackers. Conan realized that he had accrued some sort of eldritch debt that dark forces would make him repay. The next day, Conan unwittingly saved "Zaphralz," a demon servant of Kx'ulthuum that had taken the form of a human woman and sought to reclaim her master's sword, from attackers. The Mage continued to show visions of the Sword to Conan, eventually guiding him to his tomb, at which point a beam of energy burst forth from the sword, freeing the Mage. 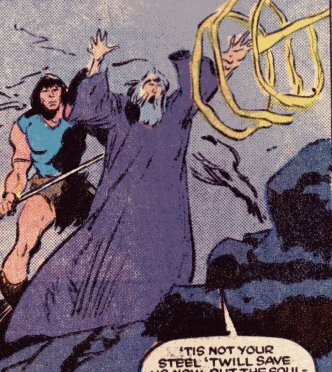 (Conan the Barbarian I#170) - Regaining his wits, the Scarlet Mage swiftly recognized "Zaphralz" as an agent of Kx'ulthuum, and used a blast of light to dispatch "Zaphralz." The Mage then used the treasures of Kx'ulthuum to bribe Conan into aiding him in his quest to destroy Kx'ulthuum. When Conan saw that he had been marked with the brand of Kx'ulthuum for having wielded his sword, Conan wanted to part of such a conflict; but when he saw that his very touch now resulted in others' deaths, Conan realized he needed to see this to its conclusion. After entering a village to acquire some horses, they were joined by Fafnir, an old ally of Conan who had lost his left arm from an infected wound and subsequently gained a millennium long life via exposure to the fluids of the egg of a mystic winged creature. They traveled towards the mountain containing the portal to Kx'ulthuum's realm. En route, they drove off an attack by Kx'ulthuum's demons, Conan using the Death-Sword and the Mage projecting energy blasts. When Kx'ulthuum sent his undead legions against them, the mage used moonlight amplified by a "gem of Kx'ulthuum" that Conan had stolen from the demon's treasures, of which the mage had been well aware. Once within Kx'ulthuum's realm -- via a spell of the Scarlet Mage -- they were assaulted by two servitor demons, "Roza" and "Xirquirtel," dispatched by Fafnir and the Scarlet Mage, respectively. The Mage led them to Kx'ulthuum's heart, but then the demon-lord himself confronted them. Conan rushed Kx'ulthuum, sword in hand, but the demon merely grabbed him and began draining his life force. Fafnir offered instead his own life force, and Kx'ulthuum released Conan, feasting upon Fafnir's millennium long life. As he did so, however, the Scarlet Mage magically levitated Kx'ulthuum's heart, and Conan skewered it with the Death-Sword of Kx'ulthuum. The demon apparently disintegrated, while the Mage was nowhere to be seen, and Fafnir apparently perished, his long life consumed by Kx'ulthuum. (Savage Sword of Conan#231 (fb)) - The Scarlet Mage had teleported himself to another realm to escape the blast of energy released by Kx'ulthuum's destruction, but was not in time to prevent his being mortally wounded. The Scarlet Mage gathered up the arm of Kx'ulthuum, all that remained of him, and bound it to Fafnir, reducing it to his size and replacing the Vanirman's own left arm, and saving reviving Fafnir anew. Having sacrificed the last of his life energy in doing this, the Mage only had time to tell Fafnir what had happened before perishing. Comments: Created by Michael Fleisher, John Buscema, and Bob Camp. Given that he's the CRIMSON mage, I'd have to guess that the images of him wearing purple (about 75% of #170) were in error. 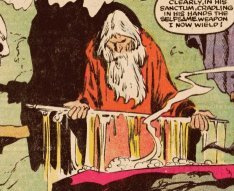 Conan and Fafnir were active in a Nemedian village in Conan the Barbarian I#166, and 169-170 took place fairly soon after, so I'd guess Kx'ulthuum's realm was accessed via a mountain in Nemedia.